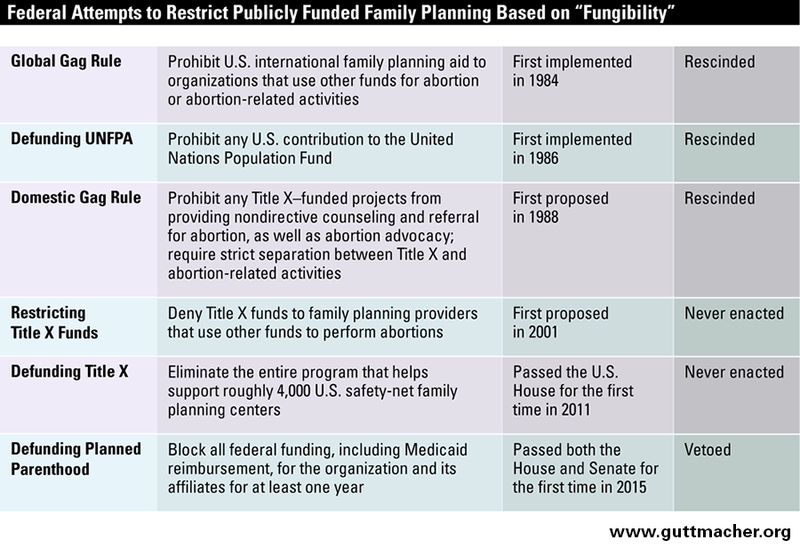 Since the late 1970s, variations of the fungibility argument have been deployed to attack family planning programs and providers at the international, federal and state levels, along with access to other health coverage and care. Fungibility-based attacks on family planning programs and providers are conceptually flawed, deeply hypocritical and show complete disregard for the vulnerable groups of women in need of family planning services. Repealing abortion coverage bans and restrictions like the Hyde and Helms Amendments is good policy in its own right and also the surest way to put an end to fungibility-based attacks on family planning. What constitutes taxpayer funding of abortion? This question has been the common thread in recent and high-profile policy battles, ranging from passage and implementation of the Affordable Care Act (ACA) to attempts to defund Planned Parenthood. Direct federal funding of abortion care has been banned since the mid-1970s in all but the most extreme cases, both domestically and in U.S. foreign aid programs. Regardless, the question continues to arise, in large part because of reproductive rights opponents’ long-standing reliance on the argument that “money is fungible,” which they use to attack access to not just abortion, but family planning and other health care services as well. “Fungibility” is the presumed interchangeability of government and private funds. As applied to abortion, the argument goes that taxpayer funding should not go to organizations that use their own funds to perform abortions (or related work, such as abortion counseling, referral or advocacy), because doing so frees up other resources, which amounts to indirect government support for abortion. It is premised on the notion that once an organization accepts even a small amount of government money for a discrete purpose, the government may dictate how that organization spends its private money as well. Promoted by abortion opponents for four decades, the fungibility argument is central to several long-standing strategic goals of those opposed to abortion and reproductive rights more generally: to make abortion care less accessible; to stigmatize abortion and isolate it from other health services; and to use opposition to abortion as a cover to weaken reproductive health services and providers more broadly. Building on the Hyde and Helms Amendments, abortion opponents have used fungibility primarily as a cudgel against organizations—both internationally and domestically—that receive U.S. funds to provide contraceptive services, but use other funds to provide abortions or abortion-related counseling, referrals or advocacy. The fungibility argument has long been the justification for attacks against the U.S. overseas program for family planning and reproductive health (see table). This strategy has manifested itself in two key ways. The first is the global gag rule, also known as the Mexico City policy, which was first imposed by President Reagan in 1984 and prohibited U.S. international family planning aid from going to foreign nongovernmental organizations that used their own, non-U.S. funds for abortion services or advocacy (see “The Global Gag Rule and Fights over Funding UNFPA: The Issues That Won’t Go Away,” Spring 2015).5 When implemented, the global gag rule hampered some of the developing world’s most effective family planning programs. The second strategy is blocking U.S. funding for the United Nations Population Fund (UNFPA), based on the allegation that the organization indirectly supports coercive abortions in China, despite U.S. government findings clearing it of any involvement in such practices. Both these restrictions have become political footballs and have been imposed or eliminated depending on the political party of the U.S. president.5 Neither policy is currently in place. In the domestic sphere, too, fungibility-based attacks on family planning providers and programs have been a mainstay of antiabortion and anticontraception activists’ playbook for decades.6,7 Many of these attacks have focused on the Title X program, the lynchpin of the national system of safety-net family planning providers. In 1988, the Reagan administration issued regulations that came to be known as the “domestic gag rule.” These regulations prohibited Title X–funded projects, which were already barred from paying for abortions, from engaging in nondirective counseling and referral for abortion, even when specifically requested by the woman. In addition, the regulations required the physical and financial separation of Title X projects from any program providing abortion or information about the procedure, and barred Title X–supported providers from advocating for or otherwise promoting abortion. All this resulted in lengthy legal and political battles—including a U.S. Supreme Court decision and legislative override attempts by Congress—that ended only when President Clinton suspended the regulations upon taking office in January 1993. The Clinton administration’s regulations did not end the attacks on Title X at the federal level. In 2001, Rep. David Vitter (R-LA) sought to attach an amendment to pending appropriations legislation that would have denied Title X family planning dollars to otherwise-qualified, community-based nonprofit agencies that use non–Title X funds to perform abortions. Variations of this amendment have resurfaced regularly since that time, albeit unsuccessfully. On the domestic side, having failed to deny family planning funds to organizations that offer abortions, foes of abortion rights—many of whom also oppose some or all forms of contraception12—have tried to eliminate Title X as a whole under the guise of countering abortion and defunding Planned Parenthood. In 2011, the U.S. House of Representatives voted for the first time to defund the program entirely,13 a line of attack that has since been repeated in various congressional votes. Meanwhile, the federal-level effort to defund Planned Parenthood reached its high water mark in 2015 when, following the release of a series of deceptively edited videos in mid-2015, both chambers of Congress voted to block all federal funding—including Medicaid reimbursement—for the organization and its affiliates for at least one year. This legislation was vetoed by President Obama in early 2016. 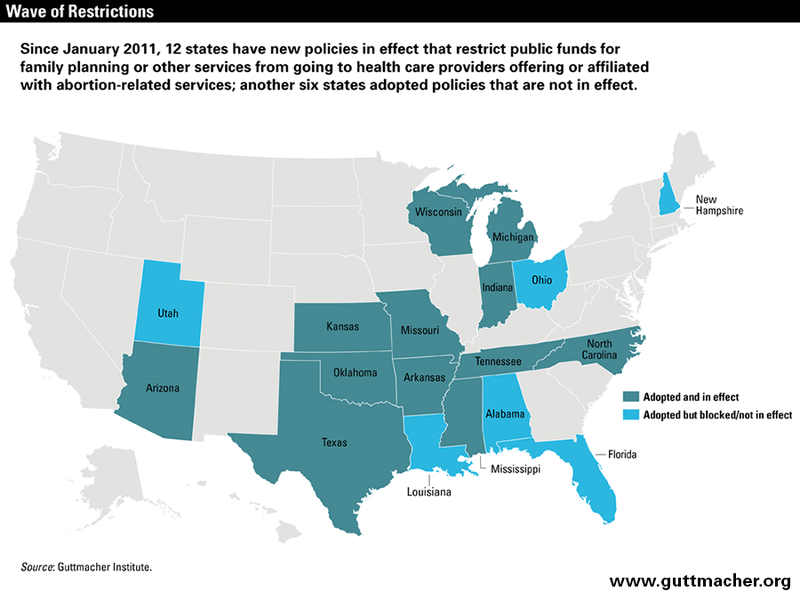 In the states, too, fungibility-centered attacks on family planning providers and programs have continued, with 18 states adopting new restrictions since January 2011 (see map). One wave of such efforts came in 2011–2013 in Arizona, Indiana, Kansas, North Carolina and Oklahoma. Many of these attacks were along familiar lines, such as enacting priority systems for distributing family planning funds or making providers affiliated with abortion care ineligible for such funds. New regulations proposed by the Obama administration in September 2016, once finalized, could head off this type of discrimination in the Title X program by preventing Title X grantees, most notably state health departments, from denying funding to qualified family planning providers merely because they also provide abortions or related care. Other examples abound: In Missouri, State Senator Kurt Schaefer made headlines in 2015 with his attempt to block the dissertation of a doctoral student at the University of Missouri, a school that receives state funding, who is seeking to evaluate the impact of the state’s 72-hour abortion waiting period. Schaefer, chairman of the state senate’s interim Committee on the Sanctity of Life, cited the state’s ban on public funding for abortion and argued the dissertation is “a marketing aid for Planned Parenthood—one that is funded, in part or in whole, by taxpayer dollars.”17 At the time, the doctoral student was employed as a research coordinator at the local Planned Parenthood affiliate; according to the university, she did not receive any scholarships or grants from the school for her research project. Related arguments were advanced at the federal level during congressional reauthorization of the Export-Import Bank. Antichoice activists argued that corporations like Boeing—which matches employees’ donations to a range of charitable organizations, including Planned Parenthood—should be ineligible to receive export subsidies because these public funds could end up supporting Planned Parenthood.20 Citing this concern, Rep. Mick Mulvaney (R-SC) introduced an amendment that “prohibits Export-Import Bank assistance involving companies that fund Planned Parenthood directly or through third-party organizations”;21 the amendment was later withdrawn. The concept of fungibility has also been deployed to undercut private insurance coverage of abortion. One high-profile example is the debate over and passage of the Affordable Care Act (ACA) in 2009 and 2010. Abortion quickly became central to the debate, not the least because opponents of the ACA seized on the fungibility-based argument that any public subsidies for insurance plans that cover abortion amounts to taxpayer funding for abortion. While the ACA was ultimately signed into law, it came at the price of the Nelson Amendment, a convoluted provision intended to appease antiabortion lawmakers by preventing comingling of public and private monies in any plans in the ACA’s health insurance marketplaces that cover abortion (see “Insurance Coverage of Abortion: The Battle to Date and the Battle to Come,” Fall 2010). Related battles have raged on. For example, in May 2011, the House passed the No Taxpayer Funding for Abortion Act, which could have eliminated abortion from both private and public insurance coverage. Most notably, the bill would have effectively forced abortion coverage out of the ACA’s marketplaces by prohibiting a plan from covering abortion if even one individual enrolled in the plan received any federal insurance subsidies. This scheme would have had essentially the same impact as the Stupak Amendment, an antiabortion proposal that Congress rejected during the original debate on health reform. Moreover, the bill would have prevented the use of tax-exempt Health Savings Accounts and Flexible Spending Accounts to pay for abortion care. The antiabortion movement’s reliance on the concept of fungibility to undermine access to publicly supported reproductive health services is conceptually flawed, deeply hypocritical and shows irresponsible disregard for the vulnerable groups of women in need of these services. On a more basic level, however, there are several flaws in the fungibility argument. For one thing, there is a longtime American tradition of involving private-sector organizations in achieving the U.S. government’s goals in areas like public health, social welfare and global development. Fungibility is an inherent possibility when involving the private sector in any government-subsidized activity, and the only way to avoid it would be for government agencies to exclusively provide any and all such services. Further, it is hypocritical to suggest that fungibility is only a problem where family planning and abortion providers are concerned, but not for myriad other government-subsidized activities, including the billions in U.S. taxpayer dollars that go to religious organizations and charities. By the logic of fungibility, any government aid to faith-based charities inevitably frees up these organizations’ private funds to proselytize or engage in other religious activities. For instance, the U.S. government awards hundreds of millions of dollars annually to groups like Catholic Relief Services and Catholic Charities that are controlled by or otherwise affiliated with the U.S. Conference of Catholic Bishops,29,30 which is often among the most vocal voices invoking fungibility-based arguments to attack reproductive health programs and providers.31 If public funding for contraceptive services indirectly subsidizes abortion, then public funds going to organizations controlled by or affiliated with the Catholic hierarchy inevitably subsidize its inherently religious activities. Notably, government funding for religious activities is prohibited under the U.S. Constitution’s Establishment Clause. But the most troubling aspect of the fungibility strategy is that, ultimately, it targets not only family planning providers and programs, but the millions of women who rely on them to obtain essential health care. The Hyde and Helms Amendments are aimed squarely at the most vulnerable women: those who are poor or otherwise disadvantaged and therefore struggle to access abortion care. Fungibility-based attacks are an extension of these harmful policies and likewise target vulnerable women—whether it is by shuttering successful programs in developing countries, by trying to dictate that women enrolled in Medicaid cannot obtain contraceptive services from the provider of their choice or by explicitly targeting safety-net family planning centers supported by Title X. Whether the harmful impact of these attacks is by design or just accepted as collateral damage in the abortion wars, it shows alarming disregard for the real-life effect on millions of women and couples. The fungibility strategy started with banning direct abortion funding and is likely to continue as long as the notion that government should not pay for abortion prevails. Reproductive health, rights and justice advocates have always maintained that to protect the health and redeem the full human rights of women in the United States and overseas, all restrictions on U.S. abortion funding and insurance coverage must be repealed. Toward that end, there have been renewed efforts in recent years—from grassroots and digital organizing to legislation introduced in Congress—to repeal the Hyde Amendment and, at the very least, to soften the harmful impact of Helms (see “Abortion in the Lives of Women Struggling Financially: Why Insurance Coverage Matters,” 2016 and “Abortion Restrictions in U.S. Foreign Aid: The History and Harms of the Helms Amendment,” Summer 2013). Ultimately, repealing all abortion coverage bans and restrictions is not only good policy in its own right, it is also the surest way to put an end to fungibility as a pretext for attacking family planning providers and programs. 1. Barot S, Abortion restrictions in U.S. foreign aid: the history and harms of the Helms Amendment, Guttmacher Policy Review, 2016, 16(3):9–13, http://www.guttmacher.org/sites/default/files/article_files/gpr160309.pdf. 5. Barot S and Cohen SA, The Global Gag Rule and fights over funding UNFPA: the issues that won’t go away, Guttmacher Policy Review, 2015, 18(2):27–33, http://www.guttmacher.org/sites/default/files/article_files/gpr1802715.pdf. 6. Gold RB, Efforts renew to deny family planning funds to agencies that offer abortions, Guttmacher Policy Review, 2002, 5(1):4–6, http://www.guttmacher.org/sites/default/files/article_files/gr050104.pdf. 7. Sonfield A and Gold RB, Conservatives’ agenda threatens public funding for family planning, Guttmacher Policy Review, 2005, 8(1):4–7, http://www.guttmacher.org/sites/default/files/article_files/gr080104.pdf. 8. Office of Population Affairs, Provision of abortion-related services in family planning services projects, Federal Register, July 3, 2000, 65(128):41281–41282, http://www.hhs.gov/opa/pdfs/provision-of-abortion-related-services.pdf. 9. Cohen SA, What’s behind the antiabortion campaign over ‘fungibility’?, Guttmacher Policy Review, 1998, 1(3):1–2 & 7, http://www.guttmacher.org/sites/default/files/article_files/gr010301.pdf. 12. Dreweke J, Contraception is not abortion: the strategic campaign of antiabortion groups to persuade the public otherwise, Guttmacher Policy Review, 2014, 17(4):14–20, http://www.guttmacher.org/sites/default/files/article_files/gpr170414.pdf. 13. Eckholm E, Planned Parenthood financing is caught in budget feud, New York Times, Feb. 17, 2011, http://www.nytimes.com/2011/02/18/us/politics/18parenthood.html?_r=1. 16. Centers for Medicare & Medicaid Services, Letter to state Medicaid directors re: clarifying “free choice of provider” requirement in conjunction with state authority to take action against Medicaid providers, SMD #16-005, Apr. 19, 2016, http://www.medicaid.gov/federal-policy-guidance/downloads/SMD16005.pdf. 18. Nelson A, Study of Effort to Exclude Planned Parenthood from Participation in Combined Federal Campaign, Washington, DC: U.S. Government Publishing Office, 1983, http://babel.hathitrust.org/cgi/pt?id=pur1.32754077661613;view=1up;seq=19. 20. Mattox C, Ex-Im and Planned Parenthood: where are our priorities?, The Federalist, July 29, 2015, http://thefederalist.com/2015/07/29/planned-parenthood-ex-im-boeing/. 25. Hasstedt K, Guttmacher Institute, Washington, DC, special tabulations of Title X appropriations, 2015. 27. Cohen SA, Repeat abortion, repeat unintended pregnancy, repeated and misguided government policies, Guttmacher Policy Review, 2007, 10(2):8–12, http://www.guttmacher.org/sites/default/files/article_files/gpr100208.pdf. 28. Sonfield A, Abortion clinics and contraceptive services: opportunities and challenges, Guttmacher Policy Review, 2011, 14(2):2–7, http://www.guttmacher.org/sites/default/files/article_files/gpr140202.pdf. 29. Catholic Relief Services, How CRS came about, no date, http://www.crs.org/about/crs-history. 30. Gallagher T, Following the money from the White House, National Catholic Reporter, Mar. 22, 2012, http://www.ncronline.org/blogs/ncr-today/following-money-white-house.